Before our team launches any media campaign, we always begin with a creative exercise that brings everyone into a creative mindset. No, it has nothing to do with yoga or chanting. It’s actually a fun game that brings clarity to the idea. 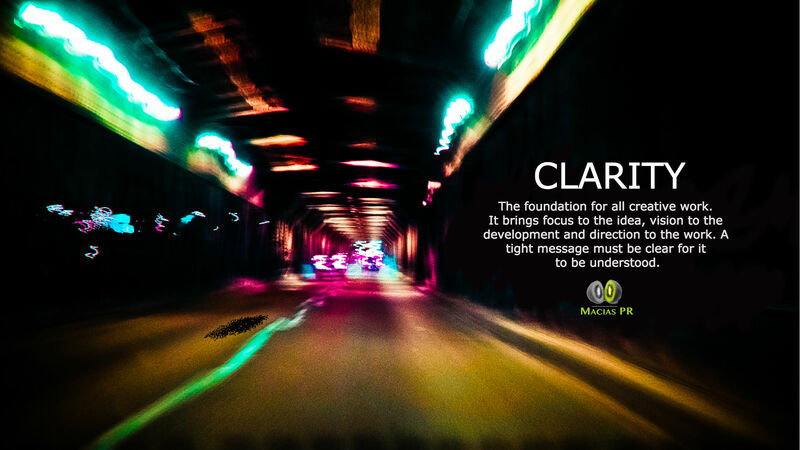 Clarity is crucial for the launch of all creative projects. As the above photo shows, it brings focus to the idea, vision to the development and direction to the work. But clarity is also needed in our communication with the media. Earlier this week, I was on the phone as a client discussed a complex topic with the reporter. Both are smart people, but clarity was missing from the message. The client went deep into the topic but the reporter was still on the surface. The idea was missing its focus. Luckily, we brought clarity back to the interview and that story will run soon. When speaking with reporters about complex topics, make sure your mind is focused. If you’re distracted with work or angry at staff, it will likely come across. Take the time to make sure you are in the right mindset, or you risk losing a crucial placement after all of the hard work is done. There’s nothing worse than landing a big interview but losing the story because the message was lost. A little clarity before the call will bring it into focus. Can I run my own PR campaign? Friends always ask me for email addresses to reporters like it is the gift that will launch their PR campaign. It doesn’t work like that with the media. You can have the email address to the editor or producer, but if you don’t have a strong narrative or angle, you aren’t getting coverage. Media strategy is more than contacts and it is bigger than ideas. A successful media campaign requires critical thinking, an understanding of the news cycle and insight into the journalist’s mind. It requires an understanding of the news consumer for that specific publication because not all newspapers or magazines are pitched the same. A successful media campaign requires continual follow-up, even when you’re best friends with the reporter. And don’t forget the time it takes to find those targeted reporters. If you take short-cuts during that research, you’re almost guaranteed to fail.